A SECOND series of the Doctor Who spin off, The Sarah Jane Adventures, has been commissioned by BBC bosses. They hope it will help appease angry fans still fuming over the news that children's favourite Grange Hill is being axed after 30 years. 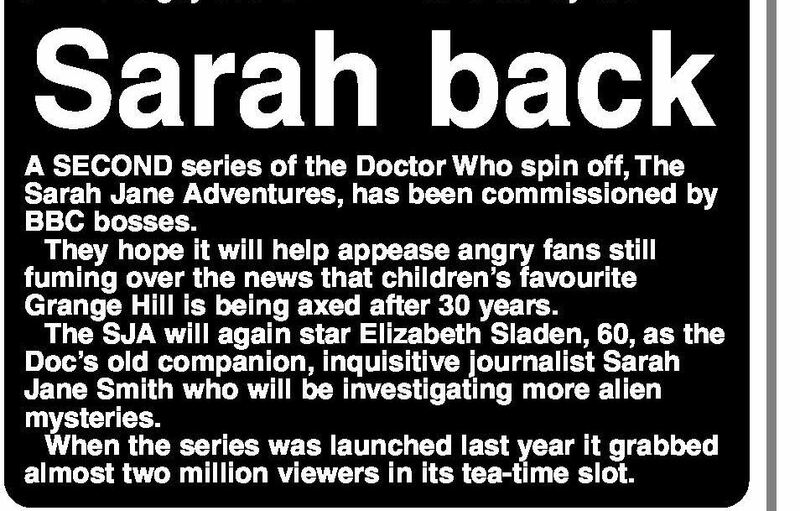 The SJA will again star Elizabeth Sladen, 60, as the Doc's old companion, inquisitive journalist Sarah Jane Smith who will be investigating more alien mysteries. When the series was launched last year it grabbed almost two million viewers in its tea-time slot. APA 6th ed. : Dyke, Peter (2008-02-11). Sarah back. Daily Star p. 17. MLA 7th ed. : Dyke, Peter. "Sarah back." Daily Star [add city] 2008-02-11, 17. Print. Turabian: Dyke, Peter. 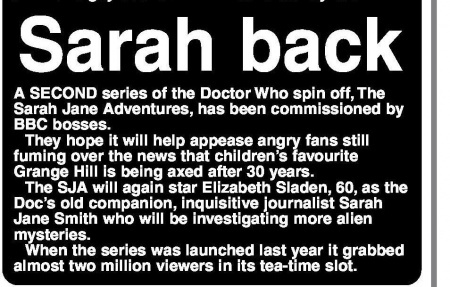 "Sarah back." Daily Star, 2008-02-11, section, 17 edition. This page was last modified on 31 July 2017, at 02:50.